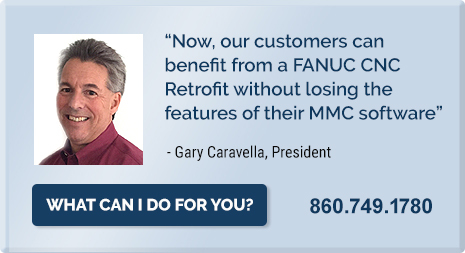 Upgrade your Makino MMC automated pallet control system with a Cell Control Retrofit from CNC Engineering. Each Cell Control package includes a new FANUC CNC system and Open Vision™ Cell Control Software. An improved operator interface and up-to-date hardware mean easier operation and less downtime, as well as better access to support, service and parts if needed. 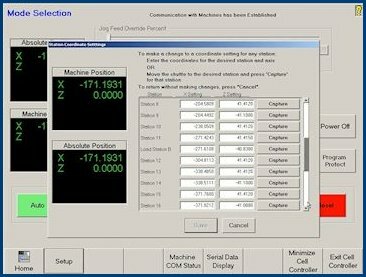 CNC Engineering’s Open Vision™ Cell Control Software package was customized to meet the needs of current Makino MMC operators. We’ve emulated and improved existing MMC functionality in an easy-to-use, industrial PC-based, touch screen environment. 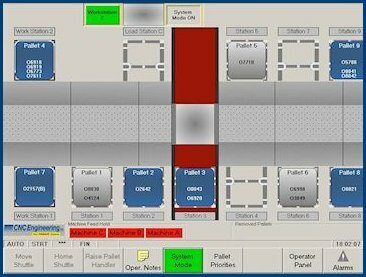 User-friendly HMI: The graphical user interface of Open Vision™ Cell Control Software allows the operator to easily set and view the status of the pallets and pallet stations. Pallets can easily be marked as “Ready to Load” and their load priority can be easily set or changed to alter the order in which pallets are processed. Improved Pallet Placement: Makino’s MMC system required a pallet to be moved to the workstation before it could be marked as “Ready to Load” and made available to the machine. This is no longer necessary, as any pallet can be moved directly to the machine from any pallet station. Flexible Workstation Settings: The original MMC configuration designated two pallet stations as workstations, thereby limiting the number of potential pallet stations. The functionality of these two stations can now be determined by the operator and set with a simple click of the mouse (or touch of the screen). These stations can be designated, independently, as either a pallet station or a workstation. Home/Random Pallet Placement: The new “Random” configuration setting allows the operator to specify whether a pallet can be moved to any available pallet station, rather than having to be moved to its specific, “Home” station. The “Random” configuration can result in faster Cell Control operation and increased spindle utilization. Direct Machine-to-Workstation Pallet Placement: Another new configuration setting allows the operator to specify that pallets should be moved directly to any available workstation upon being removed from the machine. This allows the operator to more easily access the processed pallet and perform any post-machining operations. Manual Machine Functions: The system’s Operator Panel allows the operator to move the shuttle in MPG and Jog modes. It also allows the operator to raise and lower the pallet on the shuttle. These functions provide a way of manually moving pallets from station-to-station, including the load station, without being in Auto mode. They also aid in the setup of the machine. Improved Setup Procedure: Using the manual mode of the Operator Panel, the system’s setup screen allows for capturing the shuttle’s position at the press of a button. This means quick and easy establishment of the shuttle position at each of the pallet stations, should a change be necessary due to mechanical changes or repositioning of the stations. Diagnostics/Troubleshooting: Access to the Fanuc control ladder, settings and other diagnostic tools is provided through the use of Fanuc HSSB-based software, including the Ladder Editing Package and CNC Screen Display. This access will help in any problem resolution or changes that may be required in the future. The CNC Cell control system by CNC Engineering provides an updated, easy-to-use interface for older Makino MMC automated cell controls. As can be seen from the above display, the interface for the cell control is entirely graphical. Each component of the actual cell, including the machines being serviced by the cell, is represented on the display. Operator functions are easily accessible using the touch screen interface and, where necessary, an on-screen keyboard. Any function normally performed by an operator is accessed with just one click on the main screen. This greatly reduces the amount of time that an operator spends to find the appropriate screen for the function. After entering the desired note, the operator may select the ‘Mark as Unread for other Operators’ checkbox. Doing so will cause the ‘Operator Notes’ button on the main screen to flash, alerting other operators that there is an important note to be read. Once the other operators have read the note, and unchecked the ‘Mark as Unread for other Operators’ checkbox, the button on the main screen will stop flashing, assuming that there are no other notes that are marked in this same fashion. There may be instances when a pallet is no longer able to be used in the cell. Pressing the ‘Remove Pallets’ button from the Setup screen displays the above screen. This screen displays a list of all pallets that are currently being used in the system. To remove a pallet from the system, highlight the pallet in the list and click the ‘Remove Pallet’ button. The pallet will no longer be defined as useable and will be shown on the main screen in the ‘Removed Pallets’ area. To add the removed pallet back into the cell, simply click on the small pallet showing in the Removed Pallets area. This will present a screen allowing the pallet to be ‘added’ back to the cell on any empty station. This Pallet Settings screen is made up of five main sections (tabs) and, possibly, a pallet movement button. The main ‘Status’ tab shows whether or not any of the processes is currently marked as ready-to-load, the machine(s) on which each process can be performed, the current program count, and information about any previous machining results for each process. Once machining information has been entered for any process, that process can then be marked as ready-to-load which will, in turn, mark the pallet as ready-to-load. Any pallet that is ready-to-load will then be available to be supplied to a machine when the cell control is in system mode. The Process tab(s) allow entry of information for each machining process. The specific information for these tabs is described in a following section, ‘Machine Process Information’. This screen displays a list of all pallets in the system. It allows the operator to assign a priority to each pallet. The priority is used by the cell control to determine the order in which to load pallets to a machine that is calling for a ready-to-load pallet in system mode. The list is shown in priority order and then, within that, pallet number order. Pallets with a lower number receive the highest priority when the system searches for the next ready-to-load pallet to load to a machine. Pallets with no priority (or a priority of zero) have the lowest priority. If more than one pallet has been assigned the same priority number, the pallets are given priority within that number based upon pallet number. In addition to the pallet’s priority, each item also shows the machine(s) that have been specified on any of the processes being used on the pallet. This should allow for easier assignment of priorities by the operator. Note: Pallet priorities are not required. If no priorities are assigned to any pallets, they are all treated as equal and will be selected to be loaded to the machine(s) in pallet number order. Pressing the ‘Screen Coordinates’ button from the Setup screen displays the screen above. The position of each pallet station, work station, and machine load station is determined by an X- and Z-axis coordinate. This screen, normally accessed only during initial system installation, identifies the precise position of each of these stations. Although the positions can be manually entered, using the ‘Capture’ button makes setup of the stations easier. After moving a pallet to each station in Jog or MPG mode, and fine-tuning its position over the station, pressing the ‘Capture’ button will capture the current position of the axes for that station.